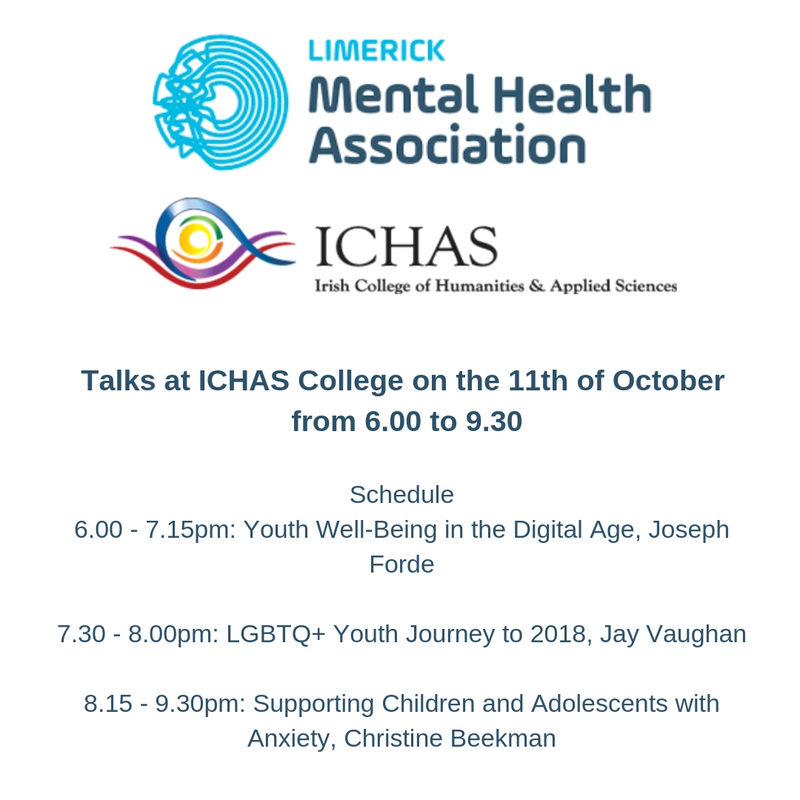 In conjunction with Limerick Mental Health Week ICHAS will be holding an evening of FREE Talks in the college on Thursday 11th of October from 6.00 – 9.30pm. Joseph Forde, a graduate of NUIG, OU, and ICHAS, has over twenty years of experience in adult education, childcare management, community education, and project management. He holds post graduate qualifications in education and education research and holds an Honours Masters’ Degree in Child and Adolescent Development. 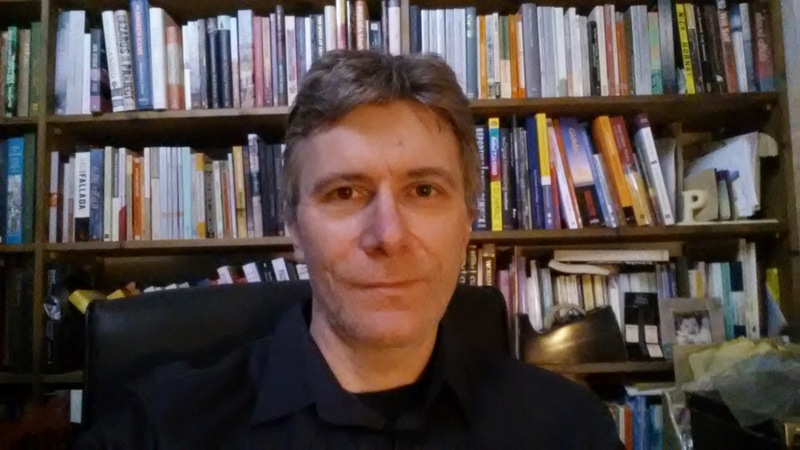 He has also completed several research projects and is published within these subject and experiential domains. His talk on “Youth well being in the digital age” will explore the implications of digital technology on Youth well-being with reference to current research findings. 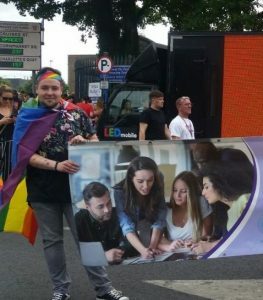 Jay Vaughan, a Tipperary native and 2nd year student at ICHAS of Counselling Skills & Youth Studies will present on LGBTGQ+ and his journey of discovery from the age of 12. Jay experienced bullying and harassment as a teenager and has gone on to volunteer for Youth Work Ireland. Jay always wanted to study counselling and is delighted that he made the leap from the IT World. He looks forward to presenting on the topic of LGBTGQ+ and providing an informative talk for the audience. Christine has been a member of the ICHAS lecturing staff since 2008, providing instruction on both the BA and MA programmes. She has a Masters in Psychoanalysis in addition to professional qualifications in Cognitive Behaviour Therapy, Stress Management, Bio-spiritual and Empathic Communication, Spiritual Development and Coaching. She also has qualifications in complementary therapies such as Reiki and Dream therapy. She has been in private practice since 1997 using counselling, psychotherapy, hypnotherapy and alternative therapies; and is fluent in English, Dutch/Flemish and German. In addition to her interest in complementary therapies, Christine also specialises in youth & adolescence; using group activities such as the exploration of life values/morality, habit management etc. as a means of encouraging young people to further their development and explore their identity.